Sheffield general practice nurses and healthcare assistants were recognised for their hard work and dedication to patients at the first ever Sheffield General Practice Nurse and Healthcare Assistant Awards. General practice nurses and health care assistants work in GP practices and are an essential part of the primary care team. They plan and provide nursing care, treatment and health education to patients of all ages. The awards have been were launched this year to recognise the often unsung work nurses do in primary care. 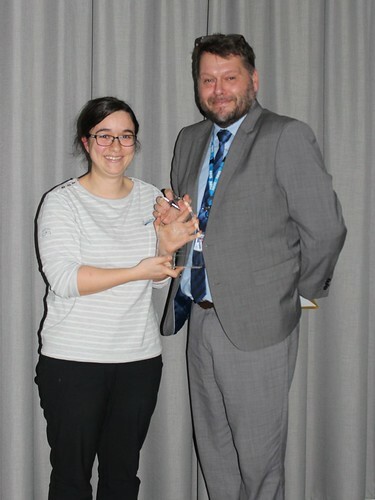 The award ceremony was organised by NHS Sheffield Clinical Commissioning Group (CCG) in collaboration with the Sheffield Practice Nurse Forum. Around 100 people attended the event that took place at Sheffield United football ground on Wednesday 6 February and a number of key figures in healthcare from across Sheffield attended to present awards. Mandy Philbin, Chief Nurse at NHS Sheffield CCG, said: “General practice nurses and healthcare assistants often go about their jobs without realising what a massive difference they are making. We started these awards to acknowledge the invaluable contribution that they make for our patients and to give credit to the vast array of talent and skills within our brilliant primary care nursing workforce. There were six award categories recognising different attributes, the categories included: innovation, commitment to nursing, mentor and preceptorship, rising star, long term condition management and one of the highest nominated areas was for the healthcare assistant of the year. To recognise the amount of nominations in this category, the judging panel created a special “thank you” award for the runner up healthcare assistant of the year. The shortlisted nominations highlighted a nurse who has worked in practice for almost 30 years, another who runs clinics for patients with language and cultural barriers, a healthcare assistant who mentors apprentices and nurses that are taking innovative approaches to nursing – to name just a few! The award ceremony formed part of a learning and knowledge initiative sharing event for nurses where attendees discussed the vision and strategy for general practice nurses and how they can raise their profile and share the important work they are doing.